State Street (Granville Road) from the collections of the Worthington Historical Society (WHS) may be used for educational purposes as long as it is not altered in any way and proper credit is given: "Courtesy of the Worthington Historical Society, Worthington, OH." Prior written permission of the WHS is required for any other use of State Street (Granville Road). Contact WHS at info@worthingtonhistory.org to request permission. State Street (Granville Road) is a picture, with genre photograph. Its dimensions are 4.44 in. x 6.38 in.. It was created in 1890. State Street (now Granville Road, Route 161) at High Street in the winter looking west. 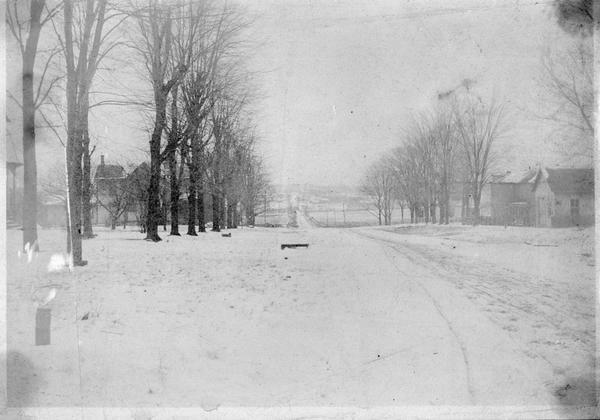 Granville Road in winter was a popular sledding site for children. Traffic was light, and children could have a long ride to the river. Sleighs and sledges were used in addition to wagons in snowy weather. The house on the left is a farmhouse built about 1895. Many of the homes on the right were replaced in the early 1920's. The Worthington Historical Society identification code is 92-U-501. The Worthington Memory identification code is whs0077. This metadata record was human prepared by Worthington Libraries on December 19, 2001. It was last updated November 17, 2017. Brr! With winter upon us in earnest, this month's exhibit focuses on scenes of dramatic January weather from Worthington's past-- from snowstorms to floods. Road construction slowing you down? Take a spin through our November exhibit for a look at Worthington's major thoroughfares before they were paved.